According to tradition, a single panel invitation is always in excellent taste. 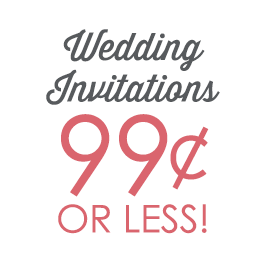 Ann's Wedding is offering you these ever-popular invitations on ecru paper. Paper weight is 100 lb text. Inner and outer envelopes are included. As the groom, handling the invitations (with my bride's input) was fairly easy through this site. The invitations look as depicted on the website and met our expectations. Web site was easy to navigate and invitations were easy to design. It was great that you could look at finished invitation to see how it was going to actually look with your own names and information. [...]everything was accurate. I would not hesitate to order additional merchandise.